Eastern Wyoming College together with the other Wyoming Community College and the University of Wyoming have been recognized by the Center for Transforming Student Services (CENTSS) for the WyCLASS website which is a project developed by WyDEC. WyDEC is the Wyoming Distance Education Consortium and its members are the Wyoming Community Colleges and the University of Wyoming. EWC distance education courses are posted on the WyCLASS website each term and faculty advisors use the website to help EWC students locate distance education courses from other colleges. The WyCLASS website also helps students from other colleges register for EWC distance education courses. The WyCLASS website won a first place award for the Administrative Core area. Although this website is a statewide site, it was a collaborative effort involving EWC Instructional Technologist Aaron Bahmer. This honor recognizes his dedication to distance education at EWC and around the state. “Aaron has been an integral part of the Wyoming Distance Education Consortium since its beginning. One of the challenges facing us was how to share information about distance courses statewide. The web page was a result of that and the fact that it has won an award is an honor for Aaron and group. It also speaks highly of how well all of the community colleges and the University of Wyoming representatives work together to help Wyoming students,” added EWC Vice President for Learning Dr. Dee Ludwig. Eastern Wyoming College recently hosted the fall board meeting of the Wyoming Space Grant Consortium. Each year the Space Grant Consortium receives money from NASA for scholarships and grants. Each college receives scholarship money in the fall to award to students in STEM (science, technology, engineering, and mathematics) disciplines for the spring semester. The total scholarship funds for EWC are about $3,000 and in year past have been awarded to 5 or 6 students, with funds being divided equally. The scholarship money can be used by the student for whatever helps to keep them in school and successful, including living expenses and transportation costs. STEM students can also apply for a transfer scholarship to the University of Wyoming. Dr. Lorna Stickel, chemistry instructor, has served on the scholarship selection committee and is a board member. “We are proud of Lorna, not only for being a member of this board, but also for her work with the Summer of Innovation Wind Energy Camp which benefited children from throughout the area. Lorna is an outstanding faculty member who is always willing to be involved in community and regional educational initiatives,” shared Dr. Dee Ludwig, Vice President for Learning. In addition to scholarships for students, grant money is available for research projects and curriculum development for STEM educators. Dr. Stickel has received these grant dollars in the past for curriculum development. This past summer, the Summer of Innovation Wind Energy Camp was held on the EWC campus for middle school and early high school students and was co-sponsored by the Space Grant Consortium. This camp introduced thirty area participants to STEM career pathways. 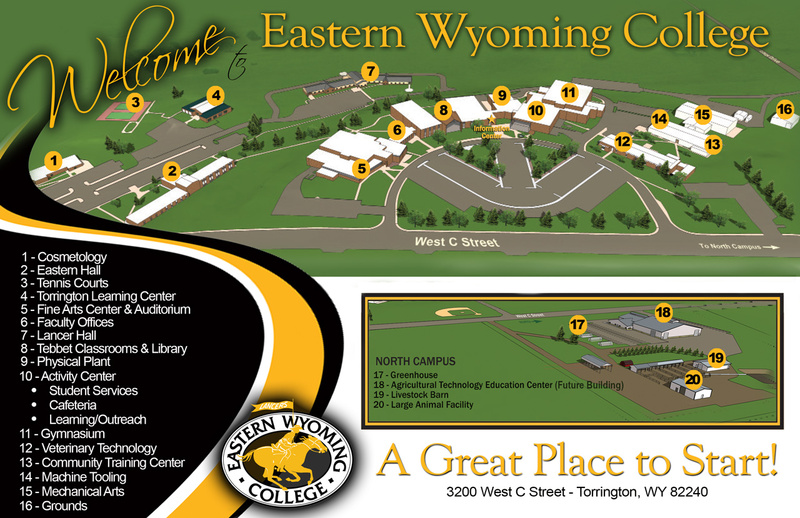 Eastern Wyoming College will be offering a CDL course in Torrington January 17th through February 14th. Class will be held from 8 am to 5 pm. Workforce training grants are available and interested individuals do need to register. Contact Jo Ellen Keigley at 307.532.8365 or stop by the Workforce Development Office located at the College at 3200 West C Street in Torrington. Classes will also be held in Douglas, Moorcroft and Newcastle throughout March and April. Eastern Wyoming College is pleased to be working in cooperation with Crook County Medical Services to train and certify Certified Nursing Assistants (CNA) students. The first class began on November 7th with seven students and there is already a waitlist for the spring class. These classes were designed to meet the CNA shortages in Crook County. Mary Ann Duncan is the instructor for these courses. Students who are interested may qualify for grant funding to support their education and may contact EWC for more details.